The FHEM web interface can be divided into three areas. To the left below the FHEM logo, a sidebar shows the most important functions (Figure 5), including functions to save configuration settings, open logfiles, and monitor events. 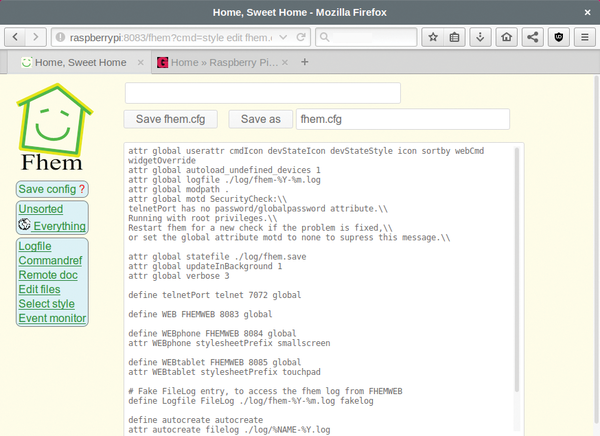 The white box at top center is for commands that are sent to FHEM. You will be using this command line often. Immediately below, FHEM displays current tasks that might be of interest, as well as all interface dialogs. 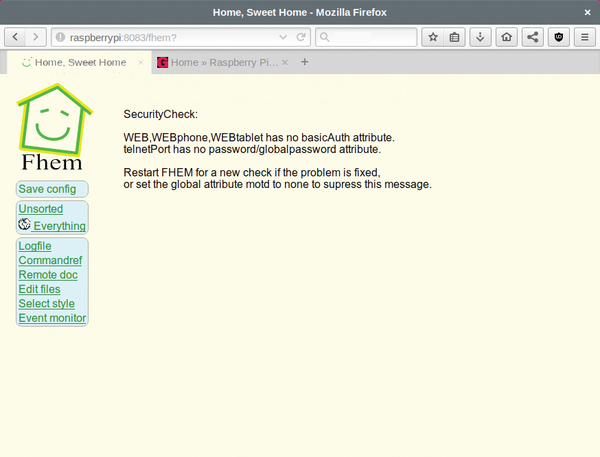 Figure 5: The FHEM web interface. In this case, the FHEM configuration file is being edited. Figure 6: FHEM complains that you have not yet entered access data for the service. in the FHEM command line. Once this editing option is activated, you can edit the FHEM configuration files directly from the web interface by clicking Edit files in the sidebar, then open the FHEM configuration file by typing fhem.cfg in the next dialog. to the FHEM configuration (Listing 1). The lines under each server configuration also need to be entered and the file saved by clicking on Save fhem.cfg in the FHEM interface (see Figure 5). To activate password protection, you should restart the FHEM service once with shutdown restart on the command line. From then on, getting to the FHEM web interface in the browser with the F5 shortcut key requires you to authenticate user identity with the access data you entered. To save the changes, press Ctrl+O and confirm the file name by pressing Enter. Get out of the nano editor by pressing Ctrl+X to return to the command prompt. Once the changes are complete, you should query the status and restart FHEM (Listing 2). Mar 31 15:25:06 raspberrypi systemd: Started LSB: FHEM server.